When I was doing my Masters in German literature, one of my good friends, Pablo, was completing his in Ocean Resource Management. Pablo is Chilean but grew up in Canada after his family was forced to flee the country during the Pinochet regime. He has also studied in Havana, Cuba. His experience in Cuba taught him what life is like when food is not in abundance everywhere. He took his lessons back to Canada where he would eat a simple meal of rice and beans at least once a week. I worked with Pablo at Liberty Wine Merchants in Vancouver's prestigious Point Grey district. Our shop was located next to a Safeway grocery store, so many customers would stop by after their weekly shopping trip. They would routinely complain about the cost of food and as a corollary, they mentioned that there is not enough food for everyone. Pablo would fire back with statistics from his program on just how much food is wasted, and how farm subsidies hurt the market and people's nutrition. You might now be thinking: "That's an interesting story, but what does this have to do with Switzerland?" Did you know that each year in Switzerland, one third of the perfectly good food we create is discarded? That is equal to two million tonnes, or enough to feed four million people. The worst offenders are not even who you might think - grocery stores. They are actually the best at preserving food compared to what they purchase. Households and restaurants are quite terrible at managing food. The end of the food production and consumption chain sees great amounts of waste. But so does the beginning: When it comes to produce, many tons of perfectly good fruits and vegetables never even make it off the farm. This is where marketing has done us a grave disservice: We are conditioned to desire carrots that are beautifully straight, and potatoes that are of the right shape and size. Crooked and misshapen fruits and vegetables are left in the field, used as animal feed or brought to biogas plants for energy production. That’s right, while in the words of Michael Pollan "we are literally eating fossil oil", our machines are being fuelled by our food. These inefficiencies are a problem for our environment, society and economy. Thankfully, three students and room mates from ETH Zürich came up with an innovative business model. It addresses how to bring nutritious and delicious foods to our plates instead of to compost piles. Lukas Bühler, Remo Bebié and Thomas Lehmann, all under 26, won the Social Impact Award from ImpactHUB Zürich. Their idea: To launch a food bike and sell meals created from produce that would not have even found its way to the supermarket. They were later accepted into the business accelerator innovate4climate, sponsored by Climate KIC and the WWF. Working with chef Mirko Buri who prides himself on no more than 3 percent food waste in his kitchen, they have found someone who knows how to treat food with respect. Thanks to the creativity in his meals, Buri is able to address two of the main factors that drive the modern food cycle: availability and seasonality. With the project Zum guten Heinrich, the three young men, with backgrounds in climate scientists and economics, hope to have found a business model that makes the cause more than a charity. 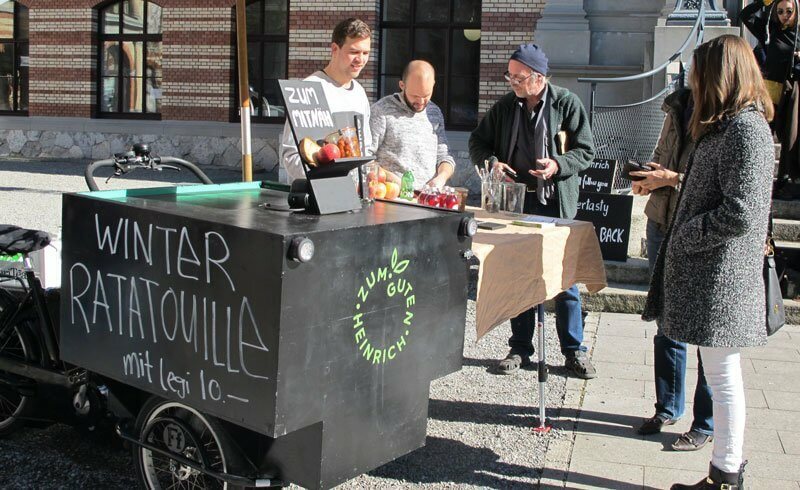 The goal is to make the food bike project economically feasible and expandable in order to meet customer demand across Switzerland. Thanks to a crowdfunding campaign, the lads are hoping to raise enough money to build a much lighter version of their bike. This will allow them to deliver food made with fresh Swiss produce. Along with lunch deliveries, Zum guten Heinrich also provides catering services which have gained attention among larger corporations. According to Remo, the demand for the food is there - they just need to make it and deliver it. A lighter bike will make the delivery that much easier. In order to eliminate waste, food is packaged in visually appealing "Weck" glasses. If returned, the glasses will be cleaned and re-used. Or they can be used by customers for their own purpose. Glass has the added benefit of being taste neutral. If you are interested in having innovative, seasonal and nutritious meals in Zürich (and soon in Bern), support Zum guten Heinrich on WeMakeIt.